In this episode, we talk about sacrificial helpers’ syndrome, great for people who are in the helper profession or volunteer helpers. Sacrificial help syndrome can be defined as people giving more than they have for the people they serve. 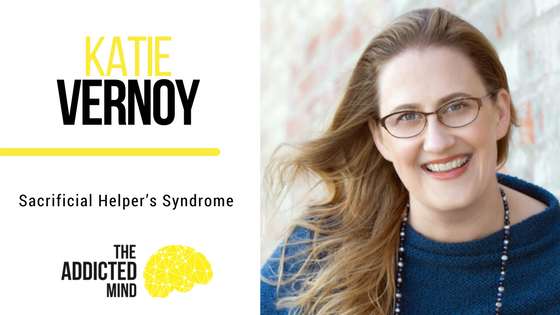 Our guest today is Katie Vernoy. A licensed family therapist, a coach, and consultant with helpers based in Torrance, California. As she says, she helps helpers to help better. Most people who’ve had traumatic experiences that completely changed their lives can end up with this syndrome because they just want others to get through it better than they did and in between that they don’t think of taking care of themselves. For therapists, they put their own needs at bay and focus on what other people need and how they can help them. Working past normal working hours, neglecting own self-care practices, scheduling in clients during personal time, foregoing meals just to help someone out are mostly signs that you’re sacrificing yourself too much. Katie’s experience came about when she was working in public mental health. She worked extra hours, focused more on her staff and clients and she literally burned out because she was so passionate about what she was doing to the point of neglecting self-care. After going out solo, she realized it was important for helpers to take care of themselves because if not, eventually, the help they offer won’t be available. Within the profession, it’s often expected of you to be overly benevolent out of the goodness of your heart. So when you ask for money, or set limits and say no sometimes there can be a backlash from the society. It’s expected of you to do this. However, part of your helping has to have some limits because you need to empower people to start their recovery on their own. Access if the client’s emergency call is a crisis or if it’s possible for them to problem-solve on their own and practice self-soothing techniques. Yes, it’s hard to say no to a client at a critical moment, but learning to set limits helps tremendously in improving your service. Most often than not, when you start feeling as though your clients should cancel on appointments or grumpy, or you feel fatigued and burned out, it’s a sign that you’ve started or are giving too much already. At this point, you don’t have the ability to care much anymore and it’s a clear sign that you should take some time off and do some consultation. Never risk your own recovery for someone else’s. The first recovery of the syndrome is recognizing you’ve got a problem. You should then address it in a practical way and start making time for yourself. Set aside some time to do some mandatory extracurricular activities e.g. meeting up a friend, shopping, surfing etc. Really make sure you hold yourself accountable or find an accountability partner. This will help you make better choices and get some well-deserved rest. You’re valuable, take care of yourself. Characteristics of sacrificial helper’s syndrome. Why helpers fall into this trap. Signs that you’re starting to give too much away. How vicarious drama and compassion fatigue leads to imposter syndrome. Steps to take when you realize you’ve got sacrificial helpers’ syndrome.